Day 28 (January 31st, 2012) found me meandering the Iron Mountains in an area with a complex jumble of peaks and ridges. 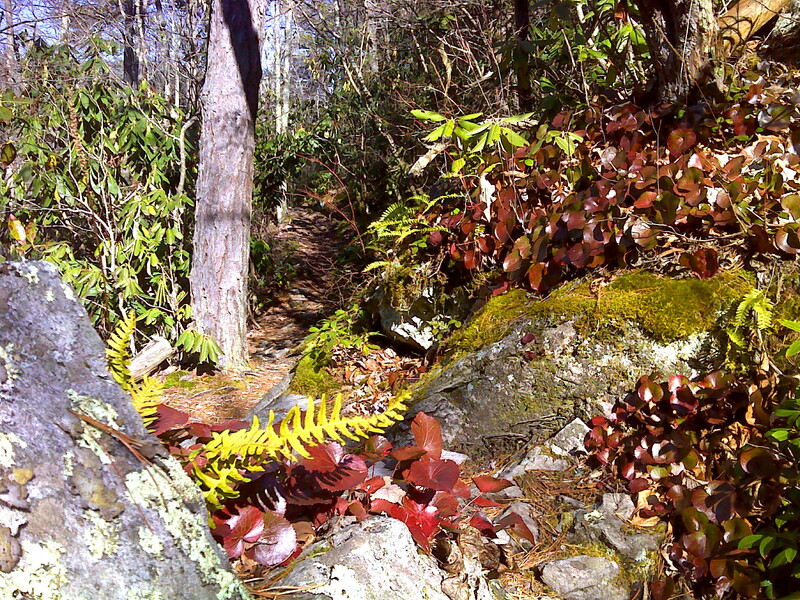 Somewhere in the photo above the AT rambles along a mountain side below Iron Mountain Trail, route of the original 1937 AT. The original trail takes a no-nonsense route through this area, the new trail takes its good old time. 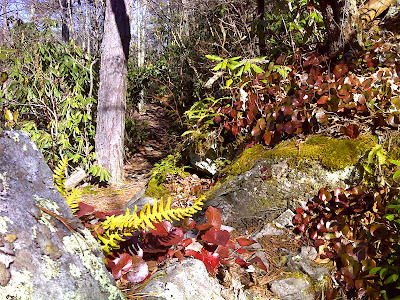 This is the Mount Rogers National Recreation area, and the trail seems to want the hiker to linger here and savor the variety of flavors this topography has to offer. And the savoring seems worth it. Today's menu began with a gentle ascent to a high point called ... uh ... High Point, where dwells a truly entish (as in J.R.R. Tolkien's Treebeard) being I call 'Goblin Tree'. Then begins a long, mostly gradual 1200 foot descent to the South Fork of the Holston River, sometimes passing softly over mossy treadway, later traversing the grandeur of a stadium-sized natural amphitheater, now offering respite in the sturdy Trimpi Shelter with its thick stone walls, interior fireplace and metal roof and then finally passing over a rustic hand-hewn log stile as threshold to a peaceful open meadow. The first was Ted, who, with his husky Jack was holed up in Trimpi Shelter, seeming stocked up for a long stay while awaiting a court date on a DUI charge (said he'd been there since Jan 10th). Ted's from New England, with a voice like Survivor's Boston Rob. He was reading John Grisham and snacking on fig newtons while we chatted. I'm not sure if I got the story straight, but his driver's license was suspended, and he may have had little choice but to seek public shelter until the case is resolved. The other encounter was with 'Shortstop' the man I described yesterday as older than me and wearing shorts and a t-shirt. Today was so mild that we were both thusly attired. Shortstop is doing a series of day hikes in the area north of Damascus and planning to work through the entire trail, doing a serious chunk come spring. As I suspected, he was with the other man I passed yesterday who asked about water sources. Unfortunately this partner wanted no more of Shortstop's pace. He opted out of today's day hike, so Shortstop was doing a solo out-and-back instead of the planned two-vehicle one-way traverse. Finally, in the afternoon, came the main course, and the reason, I suspect, why the AT was re-routed off the ridge top. It took me through one of those beautiful secluded glens where a cascading stream called Comers Creek fills the space with its clamor and cacophony. And most sonorous of all was the waterfall. The AT crosses a sturdy foot bridge just below this, affording a glorious view - a place to linger and soak up the peace and natural beauty. One of the benefits of hiking the AT in winter is that streams such as this are full to the brim and putting on their best show of the year. I'm an amateur connoisseur of waterfalls, and this one struck me as having an especially pleasing balance and symmetry. In all, a tasty and nutritious day in the Iron Mountains. I left the table well satisfied.